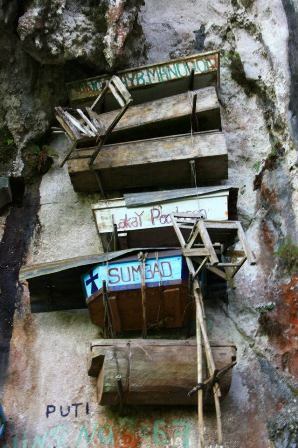 In Sagada, northern highlands of the Philippines, the ancient burial ritual of hanging coffins from cliffs has been going on for more than 2,000 years. This religious practice that became a tourist attraction, somehow managed to keep the core traditions of the ethnic group such as the Kankanaey, to which the people of Sagada belongs to. For them, though death is awful as it takes the deceased from his family members in the physical world, they believe that the spirit of the departed continues to make connections to the living. As the elders of the town reach golden age, they begin to carve their own coffin. However, if the person is too weak or ill, other family members or relatives will do it for them instead. The coffins are made of hollowed log of pine or lumber, customarily, they are smaller than the actual size of the deceased. The dead is placed in fetal position to fit into the coffin. The townspeople believe that the dead should get out of the world the same way they got in, by doing so, the deceased will have a complete peace. The cadaver is also smoked to avoid fast decomposition. Pre-burial rites begin when the person is on his dying stage, animal sacrifices will be performed together with chants and prayers for the dying person. When death finally falls, family members are required to eat and stay with the departed and are not allowed to leave the village. They are also asked to offer any help they can give, this will prevent misfortunes to happen among the remaining family members. The coffin are hung in high-elevated cliffs, on the way, it is encouraged that many people to carry the corpse. It is believed that the body fluid of the dead if smeared to the person carrying the coffin gives good fortune, luck, success or skills from the dead will be inherited whoever carries the coffin. Hanging the coffins in high-elevated is a century-old belief, some believe that the higher the body is laid, the closer the person is to heaven. Today, people from Sagada still observe the traditions and rituals of their ancestors. 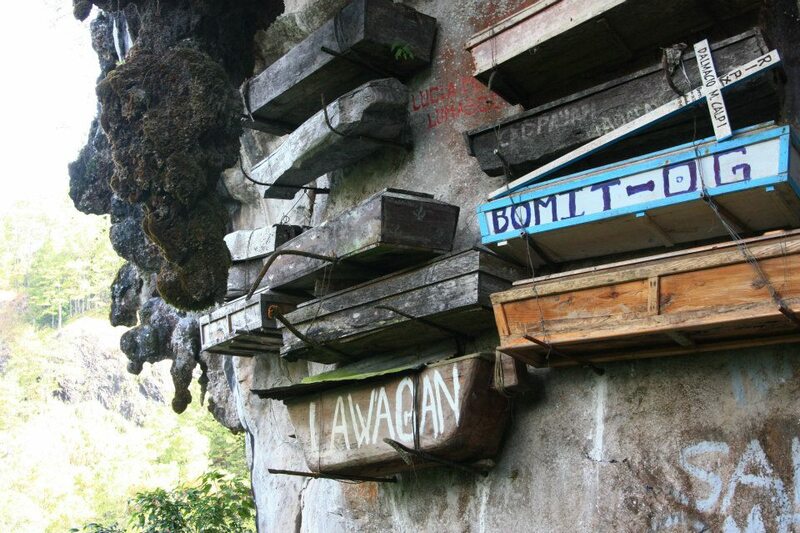 The Hanging Coffins of Sagada, preserved traditions yet adapted to modern times. Traditions that remained intact and depict culture with mystique charm. Make sure to subscribe to my mailing list to get and read my latest blog. Or, follow us on Facebook or Instagram to stay on the loop. Feel free to email me if you have any questions or comment below. Next Next post: Oh my Hot Tamales!